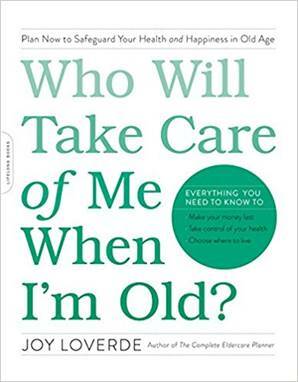 I highly recommend Joy Loverde’s recent publication Who Will Take Care of Me When I’m Old? Joy tunes into the inevitable journey that may inevitably be taken alone, or as she aptly describes as solo. During my years working in long term care facilities and home care I saw firsthand the solo traveler who still may have had adult children or grandchildren or none. Many of those travelers had a community of friends who maintained a connection–others did not. The journey without a PLAN is a tough one if there is not a plan to pay for the care and surroundings that become one’s home. Joy is a firm believer in long term care insurance, elder law assistance where needed and most of all making sure the journey is one worth living.